Over many years we have been encouraging teacher training organisations to give more consideration to the requirement of left-handed children and providing information to help raise teachers’ awareness of the issues. There are a few simple things teachers can do in the classroom to make a dramatic difference to left-handers in their early years at school and avoid problems as they develop through the education system. Having left-handed scissors available and know how to use them. Understanding that left-handers will form some letters in a different direction to right-handers. 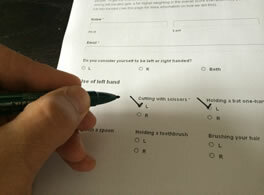 Unfortunately, we know from the huge amount of correspondence we get as well as responses to our surveys and comments on our website that these things do not happen as a matter of course. Often it is only when the teacher is left-handed or the parents of the left-handed child really push for changes that the left-handed children get the proper advice and help they need. Understanding the needs of left-handed children and how to help them is supp0sed to be a part of the Teacher Training Curriculum in the UK, but it seems to get little attention in practice. We are very keen to raise awareness of this issue and to encourage teacher training organisations around the world to actually DO the small things that will make a lot of difference. We are going to use this year’s International Left Handers Day on 13th August 2012 as a platform to get publicity about it in print, radio, TV and online media around the world. The starting point is to pull together information on what is currently happening around the world and then to create an action plan that we can push to have included in all teacher training courses and be distributed to all teachers, and we need YOUR help! If you have any knowledge or expertise in this area or would be willing to do a bit of research in your country we would love to hear what you can find out. We will bring it all together on this web site and keep you informed of progress and further work we need to do. We are also keen to hear about your personal experiences and those of your children. We are particularly interested in younger children as it their early school years that can make a big difference, but we are going to include education right through to university / college level. Contact Keith about teacher training on left-handed children. Your own personal experiences or those of your children – good and bad! I am left handed and writing a book to encourage left handers and also raise awareness of challenges of left handed people in the righthanded world. Over many years I have tried to find ways to help L handed pupils in my class, and feel I have some experience and expertise in the matter. I came across your 2014 web page, and just wondered if there is anything currently being done regarding research, training, etc. I would be really interested to be involved. Thanks. So my 6 year old son is left handed! His school says we need to work on his letter formation and when I asked if there were any left handed specific guidelines or techniques they told me no, he just to learn to write the same way as right handed kids! My daughter is in year 1, left handed and on a recent school visit was surprised to see her struggling to cut with a right handed scissors. There were left handed scissors but she had not been told they were for her to use. It was disappointing the teacher demonstrating making puppets didn’t point out there were left handed scissors for the children left handed. I spotted 3 left handed children on a quick scout of the class. With regards to the four areas noted in your article I would like to respond with my own thoughts, being a left-hander, with a left handed Mother who also happens to be a teacher. •Sitting a left-handed child on the left side of writing areas so they do not bump elbows with the child next to them – I totall agree with this, I was put in situations at school there this proved to be an obstacle but was effectivly rectified by the teacher. •Demonstrating a correct writing grip and encouraging an effective writing position – as a step-parent for a 7 and 11 year old (one left handed and one right handed) I can say that neither struggles with this. However, I have seen children and adults who incorrectly hold their pen/pencil no matter which hand they prefer, I think this should be something that is encouraged no matter what and at present I believe that it is one area of the learning journey that is lacking in schools. 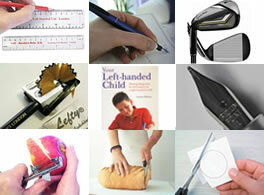 •Having left-handed scissors available and know how to use them – I totally disagree with left-handed scissors. I was never given left-handed scissors until I was in year 6 and struggled to use them because I was not used to the way they were alligned. MY 11 year old step-daughter is now incapable of using right-handed scissors for the entirely opposite reason. How is she expected to be able to go out and buy a pair of left-handed scissors that she can use as she grows up? Left-handed scissors for the kitchen? Left-handed secaturs for the garden? These things are not readily available and the fact that schools are making this division amongst students in this way, in my opinion, is not helping but hindering them in later life. •Understanding that left-handers will form some letters in a different direction to right-handers – again, I don’t totally agree with this and I don’t understand how it is possible to (indefinitely) form letters incorrectly if you are shown the correct way from the beginning. I see my step-children both forming letters incorrectly (most notably the letter ‘O’, starting at the bottom rather than the top, which is impossible to do once you start using joined up handwriting!) and I seem to be the one correcting them, yet this does not seem to be picked up by their respective schools. I feel that this is another important area that needs addressing at school. I take note that I have placed quite an emphasis on schools and their important role in encouraging a correct writing position and formation of letters, however I feel it is also important for this emphasis to also be placed upon the parents. They have a duty to ensure that their children are adequately prepared for life outside of school and being able to write correctly is a large part of this. Any tips or pointers would be much obliged. Thanks!